Ecalpemos: Cognitive dissonance in evangelical Christian reporting of attacks on Christians in Egypt. 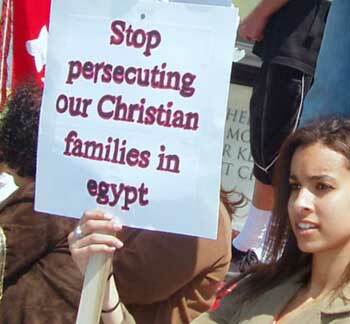 Cognitive dissonance in evangelical Christian reporting of attacks on Christians in Egypt. As the BBC reports the deaths of 24 Coptic Christians in Egypt I am left speculating how long it will be before fundamentalist evangelicals try to have their cake and eat it. On the one hand they will want to portray events in Egypt as Christians being persecuted by Muslims, but at the same time they will be discomfited by knowing that they don't consider the Coptic Church to be Christian. Lets face it. We all know that if one of these Egyptian Christians walked into an evangelical church on a Sunday they would not be welcomed as brothers in Christ, they would be a target for conversion from their ungodly faith. The same is true of Orthodox and Eastern Rite Catholic Christians. It will be interesting to track how this story gets reported by Fundamentalist commentators. At time of writing Pat Robertson's CBN has made no comment, deciding to carry a verbatim copy of the AP article. It may be too early for the US media to have picked up the story.